Cook perfect rice every time with the Neuro Fuzzy Rice Cooker & Warmer. It features advanced Neuro Fuzzy logic technology, which allows the rice cooker to 'think' for itself and make fine adjustments to temperature and heating time. The spherical inner cooking pan and heating system allows the heat to distribute evenly and cook rice perfectly. It also features different settings for cooking white rice, sushi rice, brown rice and porridge or congee. Other features include automatic keep warm, extra large LCD display, clock and timer function, detachable inner lid and stay cool side handles. This cooker is an huge improvement over my $20 padle-controlled cooker. Nice selection of options and it cooks and entire batch of rice correctly every time. I really like the warming mode after cooking, it makes timing the meal much easier. My previous cooker regularly over cooked the bottom. I had to double the batch to get the amount I wanted. Or I would try the stovetop, ususlly with similar results. Other reviews complained about the length of time it takes to cook a batch of rice. While it is true that a 20 minute stovetop batch becomes a 40-50 minute batch, the rice is cooked to perfection. Is cooking a batch of dry and burnt rice in 20 minutes really a comparison? I find that cleanup is quite easy if I remove the cover from the lid and wash it before the residue dries. The cooking pan is teflon so is easy to clean when I remove any leftovers to the refrigerator. The retractable power cord is way cool, makes storage easy. I bought this to make Japanese rice, which I do 2-3 times a week. I also bought this to replace my older rice cooker which had no fancy auto features or a clock/timer. My older one was a 10-cup cooker, but I've never used it beyond 4 cups, so this 5-cupper is great for a small family. I use it for 2 or 3 cups of rice-making. Quality of the rice is a lot better on this model if you follow the directions. I also like the pre-washed rice feature since the rice I buy comes like that. It also takes longer to make rice on this one than on my cruder rice (I say it now takes 45 mins vs 30 mins on the old model), but like I said I like the quality of the cooked rice better on this. After reading many reviews of this and other rice cookers on Amazon, I opted for the Zojirushi. So far, two months later, it has worked quite well in terms of how it cooks rice and other grains, and I especially like the time-delay that allows me to wake up to hot cereal in the morning. The drawbacks are that food crud gets stuck in the steam outlet and it's hard to remove because the lid doesn't lift off for cleaning. You have to go in with a small toothbrush or bottle brush to get rid of the goop. If you don't, it will cake up and block the vent. There is a removable metal plate in the lid that also gets dirty, but it's hand washable. However, it's rimmed by a pliable gasket that catches water, and takes a long time to air-dry. If you put it back into the rice cooker when it's wet, you can create a breeding ground for bacteria, particularly if you leave the machine unused for several days. Do you want exceptional results, consistently? 1. I can't believe I spent this much for this. 2. This rice is great! If one buys pricey Japanese rice, she must have a good rice cooker and this is the one for me! Rice is always cooked shiny, plump, and slightly sticky: perfect rice! I have been using this for over 6 months but there is no problem and no scratches in the non-stick coating. It's been going strong for 6 years now, cranking out rice by the pound -- perfect every time. These days, I cook mostly brown rice, and it's absolutely fantastic. People who complain about how long it takes to cook brown rice don't seem to understand that brown rice just takes a lot longer to cook. Many Americans cook it the same length of time (and with the same amount of water) as white rice -- which is just not right. That gives you crunchy, undercooked rice. 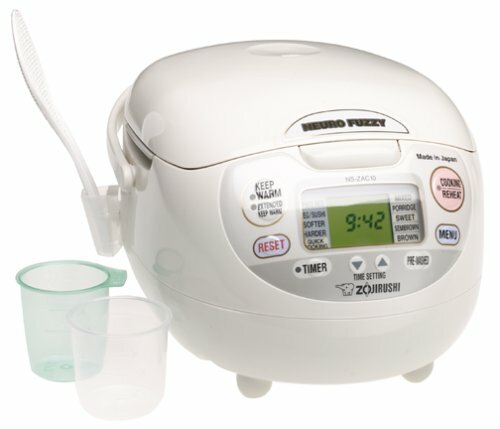 So I've been raised on 'instant' rice, and I just got this rice cooker - and it makes me sad that I was missing out on this delicious rice all those years. I've cooked around 5 different kinds of rice in this thing (sushi, brown, sweet, basmati, wild rice), and each and every batch has come out absolutely perfect. I'm dying to try out the porridge feature, I'll have to pick some up soon. One of the coolest features on this cooker is the timer. You set the time you want the rice to be done, and voila, the rice is done for you at exactly that time. So if you don't want to wait around for dinner after you get home, dinner will be waiting for you. This thing even plays music in place of timer beeps. How cool is that? I received this rice cooker today. I was torn with the size. Can I feed my family, and have leftovers with this? We are a family of five and was torn between the ten cup and the 5.5. After I ordered the 5.5 I really felt like I should have ordered the 10 cup, even though I am not crazy about adding more appliances to my limited counter space. Most reviews don't mention how much this cooker will feed. Well, for my family, we all ate to our hearts content and still had plenty of leftovers. Given that my kids are all eight and under, we don't need a larger cooker. It was quite a bit of rice that it makes! I can probably feed 7 people easily with this cooker. If you entertain a lot, or eat a lot (hello carbs) I'd go the next size up, not a big price difference. It produced excellent Sushi rice, not burned at all on the bottom, a first for me! I have gone from a fancy $$$ Breville, to an Oster and they all burned on the bottom. This came out perfect from the first try. I recommend this rice cooker, didn't give it a five, because I have not had it long enough to give it a perfect rating. Best appliance I have bought in years. Also, would like to add that it plays a cute tune when it starts the cook cycle. It is a unique appliance. I bought this to replace the Tiger rice cooker I've had to retire after 10 years. I wanted something more versatile and better at cooking brown rice (never seemed to come out quite right in the Tiger). Little did I know that this cooker would double as a grain and porridge genius! At least 4 mornings a week we all wake up to perfectly cooked, piping hot oatmeal or rice porridge. The warmer keeps contents hot(and unburned) into the next day if you like. Brown rice setting works great. Also makes a perfectly creamy dreamy polenta and many other grain dishes that are difficult to get "just right" on the stove. Be sure to get a good rice cooker cookbook for lots of new ideas. Nice short cut for fast meals- especially if your family is eating vegetarian. We love this little thing- we call it "fuzzy". it looks like a robot pet- very Japanese. Now we'll see if it withstands the test of time. Wow, after reading all the rave reviews here I expected a great rice cooker. It was anything but...I suppose if I had an hour to wait for my rice it would've proven to be the best rice. 40 minutes plus is the time stated by the directions, I figured cooking one cup would be less, but after 20 minutes the cooker had barely warmed up....I quickly got my "cheap" Hamilton cooker ($15) and voila, I had rice a few mintutes later. Makes great rice...But takes Forever! I'm south indian and I grew up eating rice every day...every meal. You would think that I would hate rice by now, but I still love it. For the last year or so, I've been using this rice cooker because my fiance bought it...she had heard it was the best. I'll make no bones about it...this rice cooker makes perfect rice every time. I don't like my rice too soggy or too dry, and I've had neither of these problems with this rice cooker. Works perfectly, and plays music too. Although I was dubious when my husband purchased this, it has been one of our best kitchen investments ever. We have rice several times a week now (far more often than we ever did before) because this cooker ios so easy to use, and it MAKES PERFECT RICE. Keeps it perfect for HOURS. For the price, I expected this unit to last longer than my parents' bigger and less expensive cooker (can't remember the brand of their rice cooker--either Panasonic or National) which they've used EVERYDAY for more than five years now, and it's still going. My family didn't use this Zojirushi everyday--but we were pretty close! After about a year and a half, the rice doesn't keep as well as it used to. It dries out faster and doesn't cook as evenly as it did while it was under warranty. Just as I expected - Perrrrfect! This unit replaces a "National" rice cooker I purchased 15 years ago. This one looks like it's younger sibling. Neuro Fuzzy logic makes cooking rice so easy. No complaints. I really like the little handles on the pot. Please read the instructions, a cup of rice, their cup is different from a standard measuring cup. If you keep it plugged in, you won't have to worry about the battery.